This weekend I tackled sorting my cards. I have 4 boxes that fit 3,500 each box and there wasn’t a method as to how they were organized. With it raining I and me feeling unproductive, I decided to sort them by sport. Below is a stream on consciousness over 4 days of sorting. Tomorrow, I will be posting some of my personal favorites that I came across. 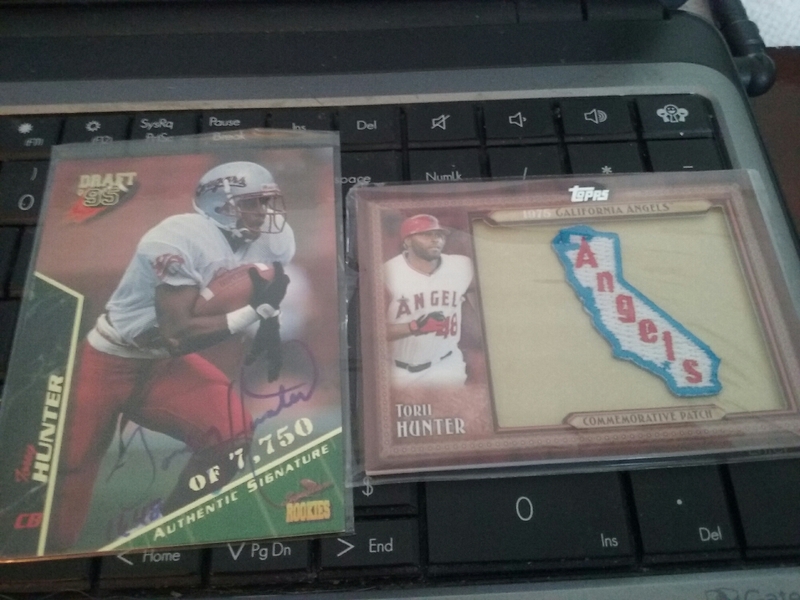 Also, a few will be posted on my Ebay for sale, and my SportsCardAlbum for trade. Feeling down because some cards look beat up like crazy. It’s amazing how some cards can look better than the day they were produced but others would look at home in the thrash. Oh crap, I can’t penny sleeve them all. I an putting aside a lot of rookies and players with no experience. I wonder how many of these guys were career minor leaguers when the card was produced. Like it matters, if I never heard of them then I should be junking them anyway. Will the cats please leave me alone. I know that I am in there space but I need to protect the cards. Found remnants of a horrible box I cracked. Andres Toress auto & Tyler Colvin jersey card; yuck. Hey Andrew Miller’s rookie is worth something after all; not much but I remember tossing the card in here when I thought that he was a bust. 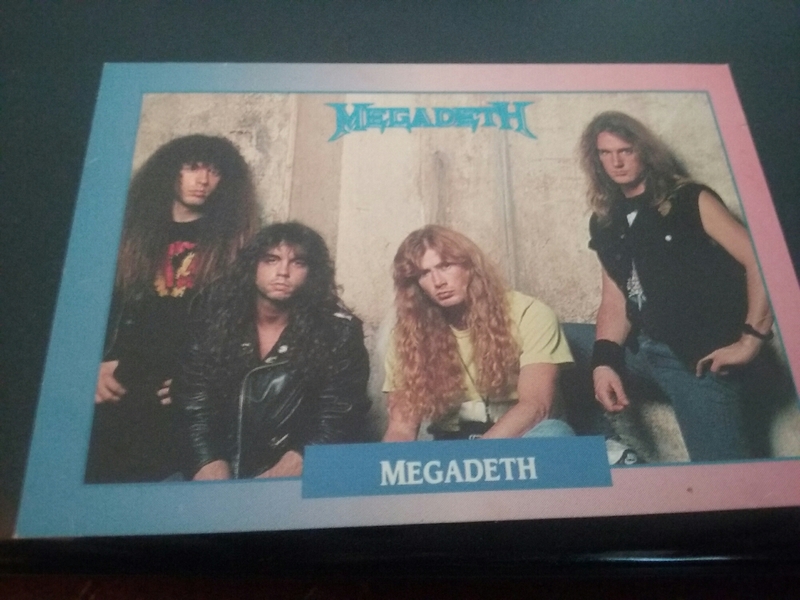 I really enjoyed the sticker books as a kid. Too bad that I write them off as an adult. I made it to box 2. I wasn’t expecting this. I don’t have enough room in my room or the house. I’ll manage though. This feels good. Dave Parker was an Angel? I am really appreciating anyone who had a long career. So many failed prospects over all sports. Jamier Moyer was a Cardinal? Its been a while since I last saw a John Elway card. For a while, it felt like I owned all of his cards. Seems like the cats know better now. They get the importance because I never get mad at them. Lee Smith was an Angel? Louis Polonia; feels like he is everywhere now in my collection. Found an early Tom Candiotti card. He always looked old. I feel like I could ditch half of my football cards tomorrow and not care. Panthers base cards still do it for me though. It is cool because as I was sorting the cards, they stuck out to me like the autos and relics did. I have too many baseball cards. Worst part is, they are all base from 80s, 90s, and early 00s so they are probably worthless. I can just imagine a thief taking my baseball boxes, thinking he hit the jackpot but then pulling a but then realizing that they are all crappy Dodgers from yesteryear. I loved reading everyone’s comments about my entry yesterday. I didn’t realize how many of you have gone through the same feelings. Today, you won’t find anything buzzworthy. What you will see is my personal favorites from sorting; and in some cases the stories that come with them. Don’t worry, less than 400 words if you remove this. 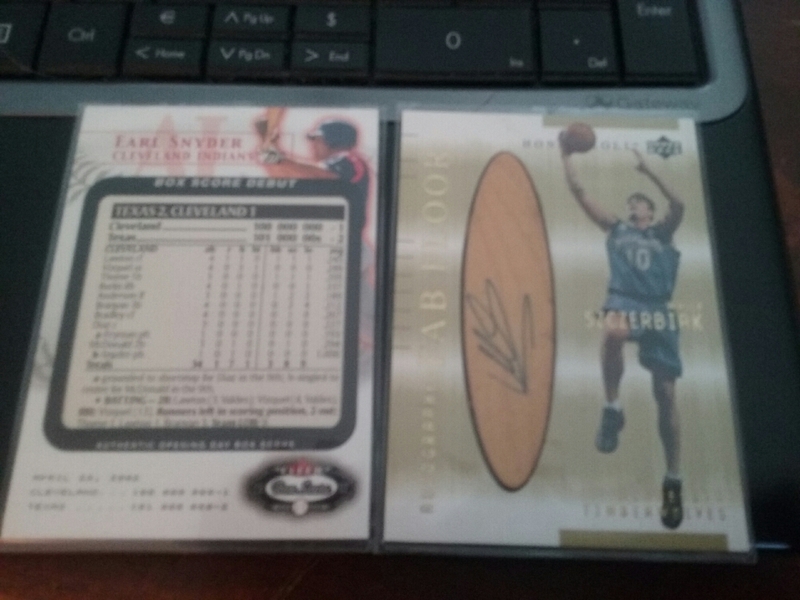 Wally Szczerbiak autographed floor piece, and a no name prospect, Earl Snyder, cut box score. As I Googled them to make sure that I spelled Wally’s name right, and whatever happened to Earl Snyder, I learned that Earl is older than Wally. 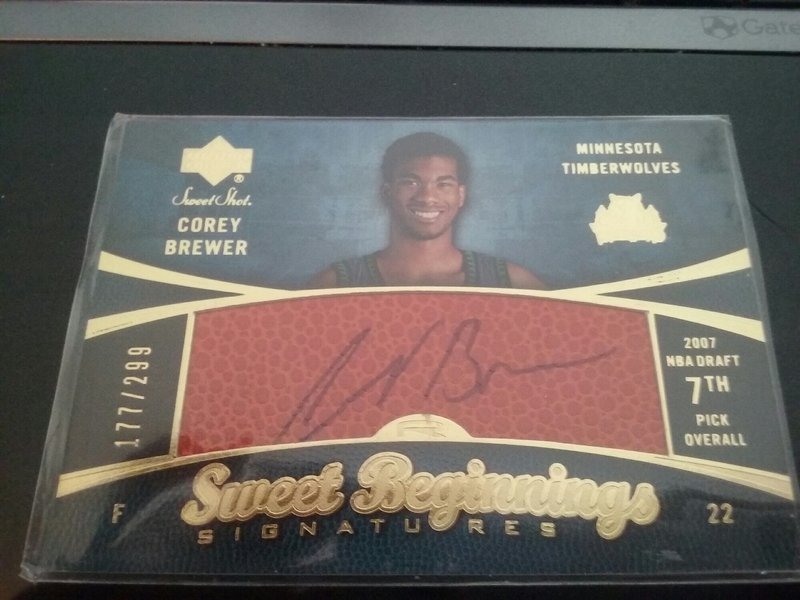 – I put this to the side because Corey Brewer is one of my many favorite players, and then yesterday he joined the Lakers. Go figure. 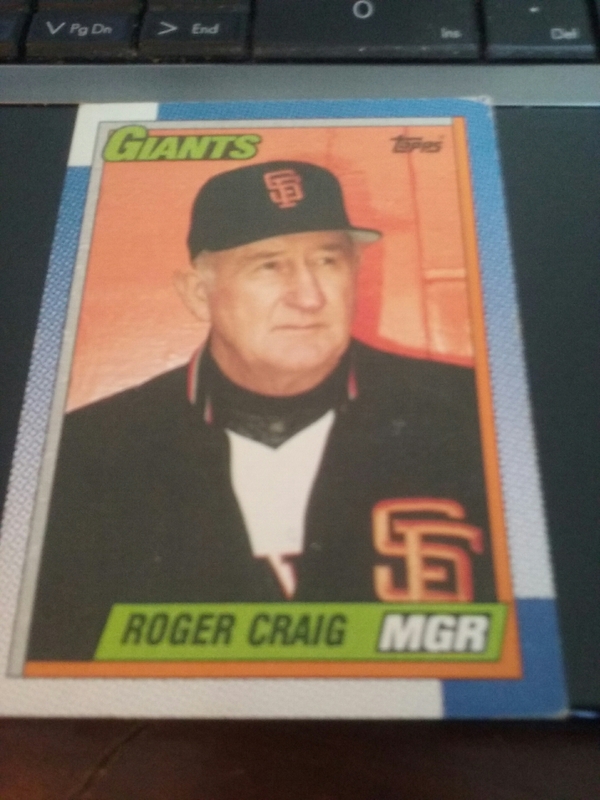 – Another one: Roger Craig was managing the Giants at the same time that Roger Craig was leading the 49ers defense in the same stadium. Interesting coincidence. – I’ll trade you this for a Pedro Martinez card. – 2 of my all time favorite Hall of Famers. I was a Tom Glavine fan the second I read on the back of his baseball card that he played hockey; even though I loathed the Braves as a kid. I learned to appreciate Morten Anderson after my best friend from Denmark made me realize that Anderson was born there. – This was one of those random coincidences. I was searching during the week of Valentine’s Day and I found one from one of the most important people in my life who is now gone. I remember sticking it in with the cards. I do random things like that. I also will stick a five dollar or one dollar bill with my cards every now and then. I didn’t find any money. 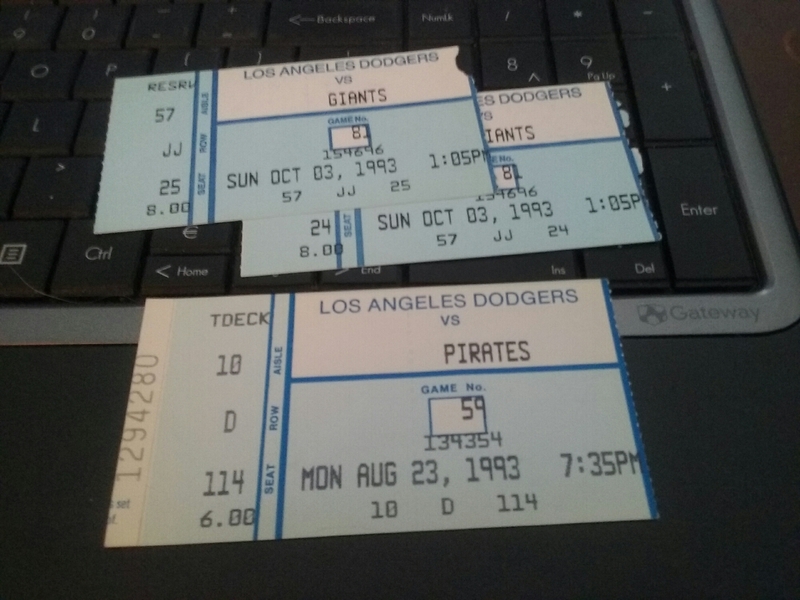 – Speaking of random things, some old tickets from past Dodger’s games. Card boxes are perfect holders for stuff like valentines and ticket stubs. – One of my all time favorite pulls. 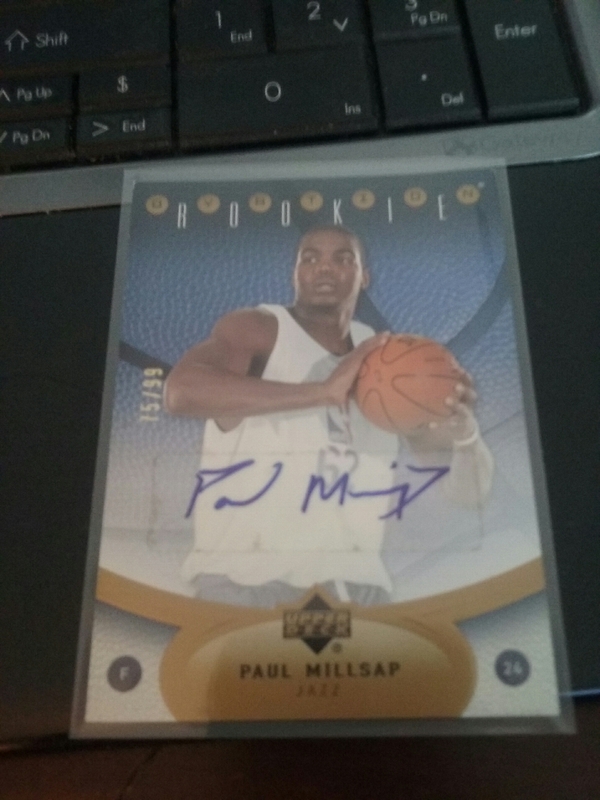 I got a birthday box to open the year that Paul Millsap was a rookie and pulled this. Normally second rounders are throwaway filler autographs but I got to watch him grow and appreciate him. First things first if you want a Misery Pack, I will sell you one for $7 Paypal friends & family, or $9 normal Paypal in the United States. Message me and say that you saw this post; my email is angrycardcollector@gmail.com – don’t send Paypal there as it isn’t my Paypal email. I have basketball, baseball, and football. Reality, and also demand for Misery Packs, has forced me to start selling. I have listed a bunch of cards on Ebay. If the prices seem high, it is because I used COMC for comparison pricing. I don’t really go by the last one sold, if one isn’t currently actively for sale. I have been working on a rant about this that will probably be posted next week. I stand by this, as I have had to pay a premium for some no names in my Prestige collection. http://www.ebay.com/usr/pandanwh – I will trade or sell any cards outside of Ebay if you message me. https://sportscardalbum.com/u/angrycardcollector – these cards are only for trade and not for sale. I am not even saying that because I am trying to circumvent from having to pay for premium on Sports Card Album. Most were given to me, and the rest are not worth much to sell to begin with. My big fish right now that I am looking for are: CJ McCollum Prestigious Premieres autograph, and Cazzie Russell True Colors jersey. 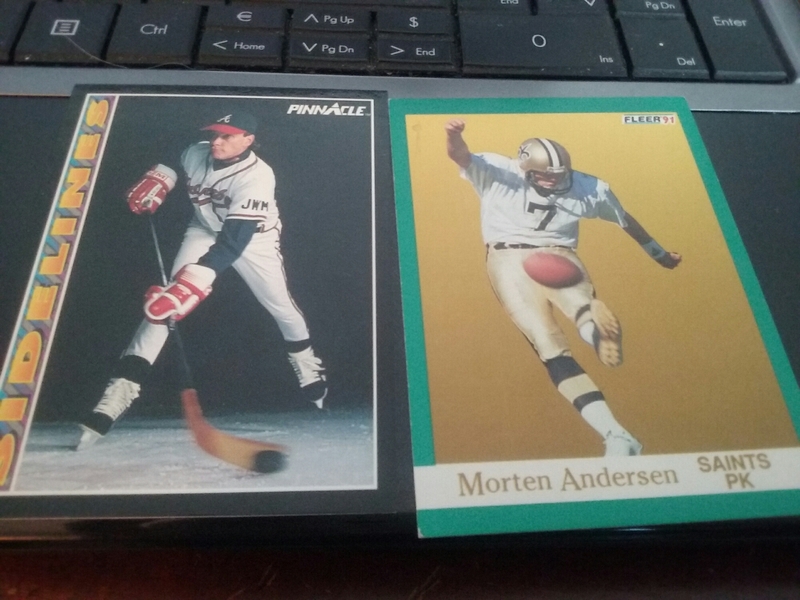 If you don’t have Prestige basketball for trade and want one of my cards, I would be open to Dodgers, Carolina Panthers, and hockey players from Denmark. On the plus side, selling will make me a more well rounded collector. It is not a bad thing that some of my rants will apply to more people. First things first. Misery Packs are for sale this weekend. You buy them on Ebay or by messaging me on any platform. Buy them here on Ebay. Comment here for an entry. Also reply and RT on Twitter for one. Plus comment on Facebook for one. I didn’t have idea what to write on here this week; then today happened. So I sold a card on Ebay; well redemption code. I was all set to send the code to the seller, but then I couldn’t find the card. 12:45 Look where card has been in my mind for past 10 days. It isn’t there. No big deal, there are 2 other places it could be. 12:55 Oh crap, not in those places. Time to look in other places. 1:15 Not anywhere else, so I go back and check the original 3 places over and over again. Did I mention that all of this is confined to my office area, only a 10 foot radius? Time to sort through files. My body starts overheating from adrenaline. Start praying. 1:30 Who am I kidding? I know it isn’t in the files. I think it got thrown away. I go to my car anyway to look. I just put a stack of cards in there to donate and that stack was too close for comfort from where the sold card was in my mind. 1:45 Not in the car. I go back up to desk area and start cleaning the only area it could be in. I guess this is a good side effect. Another prayer; I am a religious person to begin but this is overkill. 2:05 I send a panicked message to buyer. I am super embarrassed and my conscience is getting the best of me. This sold for a buck plus; and I don’t want him to think that I am having reservations. I don’t want him thinking that I used the code for myself. If I was in the same situation, I would be annoyed and think the seller dicked me on purpose. My thinking: maybe if I send this message it will lead to me finding it immediately. 2:15 Did it fall behind my bed? More cleaning. Keep praying. 2:25 Check pockets and dirty laundry. Nope. 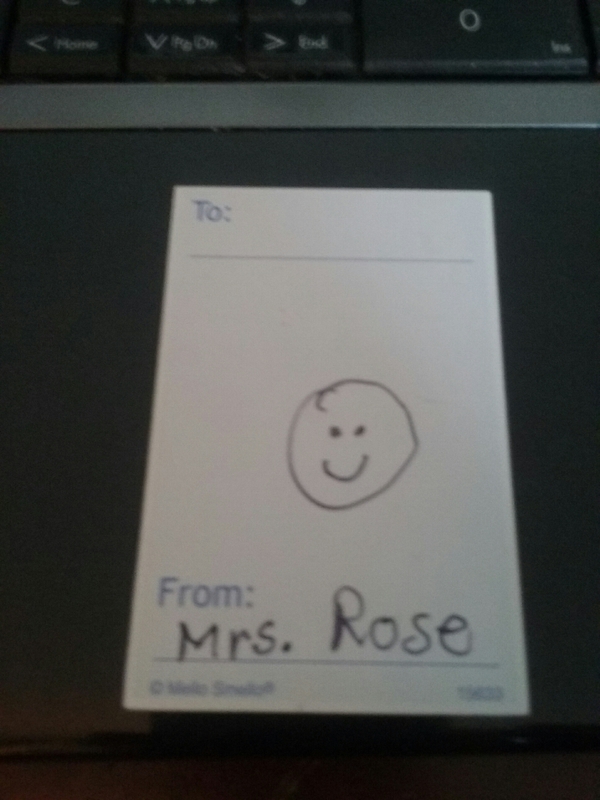 2:30 Kids come home so I can’t focus on stressing about the card. 3:50 I sit at my desk, to work on paper work. 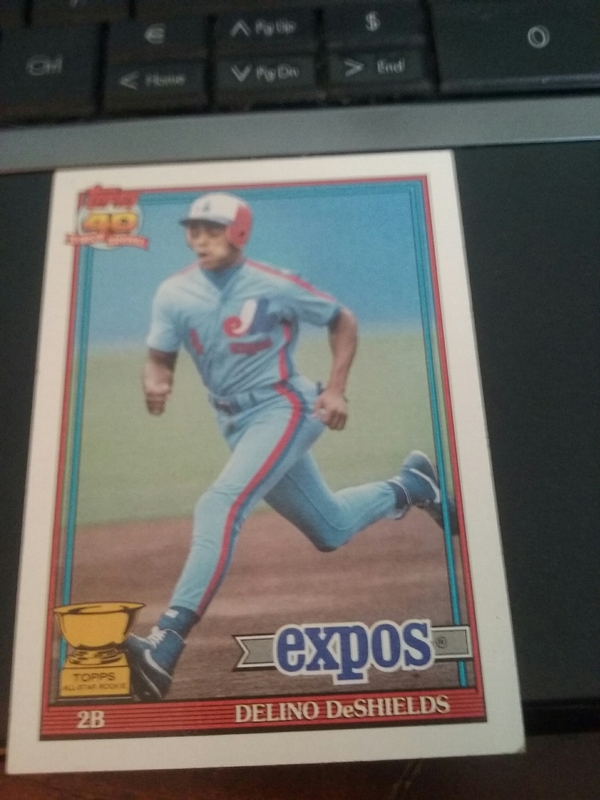 I decide to go through a stack of cards in box, that I am on the fence about selling. I didn’t go through the stack because I don’t recall touching it in this short year – the reason why I never went through it in the first place. The last card is what I was looking for. It was in the area that I was searching all along. Message me at AngryCardCollector@GMAIL.com or on Twitter if interested.